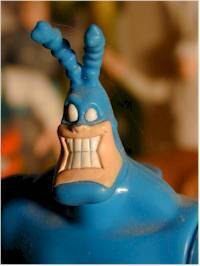 Blast from the Past - the Tick! The Tick is one of the funniest comics ever written. With it's off the wall humor, and lampooning of all things super hero, it's one of the shining stars of the 90's. And the cartoon managed to capture that same style of humor perfectly. Next fall, we should be seeing the debut of a new, live action Tick show. Time will only tell if this idea works or not, but along with that show we'll be getting a series of toys from N2. Since N2 has yet to produce a line of figures I like, I suspect I'm going to be less than enthused with these. And so I thought I'd remind every one of the wonderful set of toys we had while the cartoon was on the air. 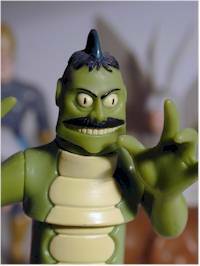 Bandai produced the majority of the action figures for this show, and Irwin distributed them in certain countries. 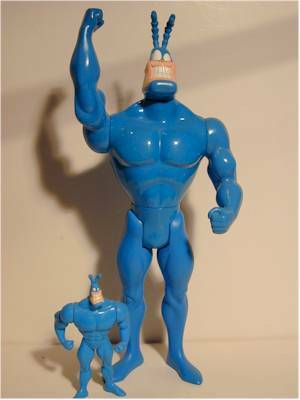 The best of the offerings was the action figure line, that included three series of figures, and covered everyone from the Tick and Arthur to Dinosaur Neil, Skippy, and American Maid. 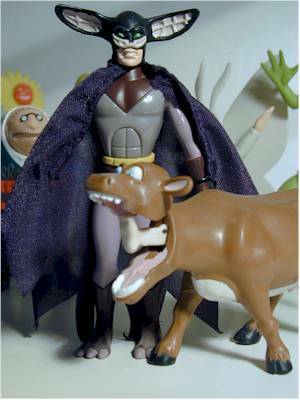 The most difficult to find in this series was the infamous Man Eating Cow and Die Fleidermaus, but at one point they ended up showing up in Kaybee Toys clearance bins for 3 for ten bucks! The third series of figures is also a little tougher to find, especially the Chameleon, but the prices on these figures have dropped drastically. Now's the time to pick them up, and you should be able to find most of them for under $15 each carded, many still only five or six bucks. The articulation on these figures wasn't fantastic, but they stayed true to the source material, and looked great on the shelf. There was a pretty good variety of characters, and even a playset. But the figures weren't all we were treated to. There was also the fantastic, 16" talking Tick, who supplies great sayings from the show with a simple press of the button. He is one of my all time favorite talking figures, and if you only get one item from the old show, this would be the one to hunt down. Believe it or not, this fantastic piece of work ended up on clearance as well. The articulation wasn't great, but the talking feature and overall look made up for it. 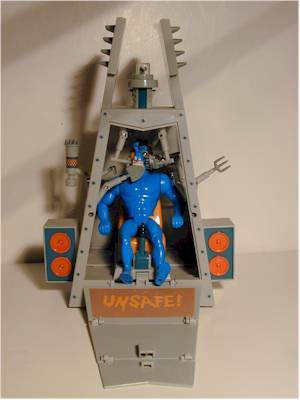 There was one, ultra cool playset released that I mentioned earlier - the Steel Box. Another terrific toy that ended it's days on clearance, this was the Ticks training mechanism. It opened up to allow him to sit inside and be pummeled by all sorts of tools of destruction. While the box was extremely cool, the number of Tick figures that could actually fit inside numbered a grand total of one - Hurling Tick (and no, it doesn't mean what you think). Even with this shortcoming, it's a great piece, and can be had for as little as ten bucks if you're patient. 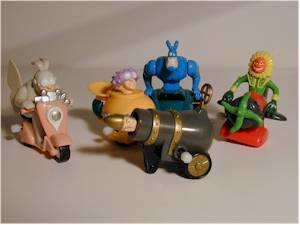 Another product produced by Bandai were small windup vehicles. While most of these were pretty silly, they were cute nonetheless. There are certainly no shortage of these on the after market right now, so you can pick them up for a song. Perhaps not the twenty five or fifty cents each you could have gotten them for at Kaybee in the clearance bin, but still pretty cheap. Bandai made a set of PVC's along with the windupsl, and these ended up on clearance just like all the rest of the Tick toys. 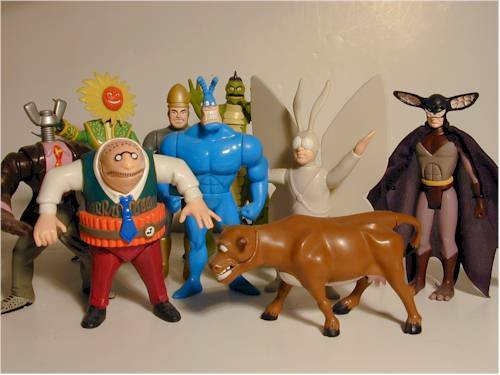 There are 11 figures in the PVC set, although at first everyone believed that the Dinosaur Neil figure had not be manufactured. It turned out he ended up as non-U.S. distribution only, and he can be found on two cardbacks - an Irwin cardback that was common to Canada, and a Bandai cardback that was more common in Australia. There were a few other products as well, one of the best being the bendy set. While nothing too exciting on their own, they did give us a unique character in the Terror. There were also a number of Kid's Meal toys from two different promotions by Taco Bell. Among the best of these were the 'balancing Tick', who balanced on his chin in a flying position, and Charles the Brain Child, who acted as one of those ball-and-cup games, using his brain as the ball. 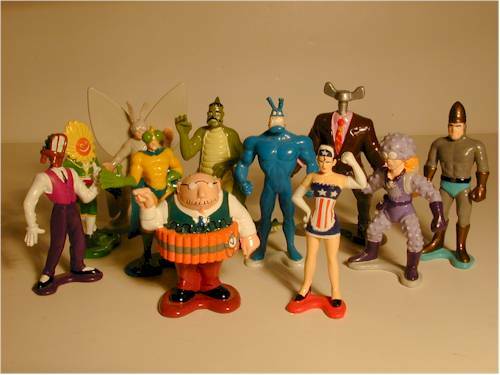 I'm not mentioning them all - there was a series of 5" talking Tick figures, each saying one phrase, just to name another - but I think you get the idea. Overall, these toys are some excellent work. If you're a big fan of the comic or the cartoon, I suggest you grab these now. Once the new show comes out, it's quite possible that interest in these older figures will come back and prices go up. Right now you can't beat the deals you'll find, and these will be some of your favorite figures for years to come.